The macula is the area of the retina that provides the best vision for reading and fine detail. 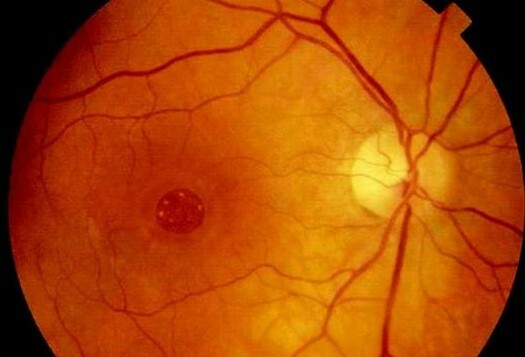 A hole in the macula can develop either from vitreomacular traction (“idiopathic” macular hole) or trauma and rarely in very near sighted people. Idiopathic macular holes are the most common, usually occurring in patients over the age of 50. The hole forms from pulling by the vitreous gel on the center of the retina. Macular hole formation occurs in stages beginning with a cyst (stage 1) and ending with a full thickness hole with separation of the vitreous gel (stage 4). Reading and detail vision is ultimately lost. Vitrectomy surgery may be used to remove the vitreous gel and close the macular hole. Fine membranes (epiretinal membrane or internal limiting membrane) are sometimes peeled from the edge of the hole and a gas bubble or oil bubble is placed in the eye to help seal the hole while it heals. When gas is used, the patient must remain face down for some time after surgery to help the hole seal. If oil is used, it must be removed with a second operation. While in most cases the macular hole will close with surgery, not all patients recover vision. Success rates vary depending on the type of hole, the duration of the hole and the stage of the hole. The other eye may become affected in approximately 10 percent of patients. As with all surgeries, the risks, benefits and alternatives must always be considered.